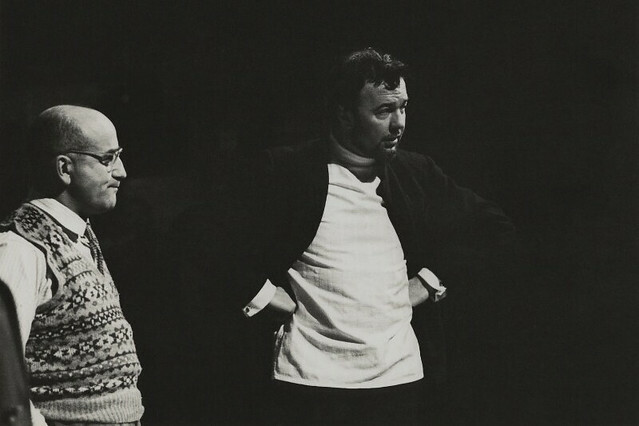 Sir Peter Hall (1930–2017), founder of the Royal Shakespeare Company and former director of the National Theatre and Glyndebourne, had a long and rich relationship with The Royal Opera. Hall made his Royal Opera House debut in 1965 with the UK premiere of Schoenberg's masterful Moses und Aron, in collaboration with Music Director Georg Solti. Hall's production was a spectacular undertaking, incorporating a huge cast, an onstage camel and four semi-naked dancers. The result was a great success, as was its revival the following year. 1966 also saw Hall's new production of The Magic Flute, sung in English and conducted by Solti, for which Hall carefully re-created the original 1791 stage directions. In 1969 Hall was made joint Director of The Royal Opera with Colin Davis, but resigned before officially assuming the post. He returned to the Royal Opera House in 1970 to work with The Royal Opera and Davis on the world premiere of Michael Tippett’s fast moving emotional drama The Knot Garden. Hall was to become associated with Tippett's works, later directing the world premiere of Tippett's final opera, New Year, which had its premiere in 1989 in Houston. 1971 saw two great productions. Eugene Onegin, conducted by Solti and with elegant sets by Julia Trevelyan Oman, became a popular favourite with The Royal Opera's audiences. Hall and Solti were again united for a majestic production of Tristan und Isolde, with which Solti marked the end of his tenure as Music Director of The Royal Opera in a run of performances starring Birgit Nilsson as Isolde. Hall's production remained in the repertory for a decade after its premiere, and was graced over the years by singers such as Gwyneth Jones, Berit Lindholm and Jon Vickers. Hall's 1988 production of Salome for The Royal Opera, conducted by Christoph von Dohnányi, starred Hall's then wife, Maria Ewing. His final work for The Royal Opera came the following year in 1989 with Albert Herring, a transfer from his hugely popular 1985 production for Glyndebourne, where Hall was Artistic Director 1984–90. His productions here and at Glyndebourne were always true to the text and the music and by all accounts he listened to, and developed their interpretations with, the singers. He will be much missed. We could do with more like him. I saw his legendary MND at Glyndebourne again last year - still wonderful. Hall's production of Tristan und Isolde was absolutely brilliant and is badly missed today. Obviously a production such as this that is true to the composer's intentions is out of fashion these days! The two productions of Tristan und Isolde that succeeded it are a travesty however successful musically they were. Bring back more producers who respect the composer's instructions. Oh gosh - a profound "Hear, hear!" Absolutely echo the vows about how he listened to the music, understood the text, worked with the singers and allowed the works to speak for themselves, without distorting them, as so many directors do today. Let us bring back such productions back into fashion now. His "Tristan und Isolde" was a highlight in my opera experience. I was at the first & last of the first series. Nilsson refused to perform the actions requested of Isolde, which were very beautiful! Farewell Sir Peter. It was a pity that the Hall/ Bury partnership did not do more. Covent Garden's loss! !